The City campus is a real feature of the Melbourne CBD. The multi-coloured buildings have become part of the Swanston St. landscape and the location couldn’t be more central. It is right in the heart of the CBD, just up the street from the State Library and across the road from Melbourne Central, which is both a shopping precinct and a stop on the City Loop meaning getting there couldn’t be easier. 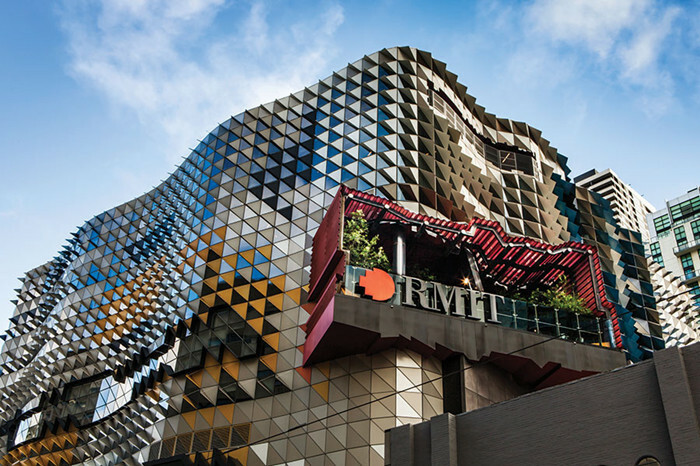 The campus is littered with award-winning buildings, including the Design Hub and the Swanston Academic Building both of which are focal points for RMIT’s tireless work in the areas of research and innovation. The venue is within walking distance of a number of Melbourne landmarks. Just head down Swanston St. and go for a short walk down St. Kilda Rd and you’ll come across the National Art Gallery, home to one of the finest art collections in Australia. You can then go for an amble down Southbank Promenande and try your luck at Crown Casino or if you head the other way, you can walk down the banks of the Yarra and into the Botanical Gardens. Hop on a tram or train and in minutes you can arrive in the vibrant space that is Richmond, full of cafes, pubs, cutting edge dining experiences and the most famous Melbourne landmark, the MCG. Chinatown is just down the road if you want cheap but delicious eats and the bustling Queen Victoria Market is just a short walk down Latrobe Street. The dining hotspot of Flinders Lane is minutes away and you are literally surrounded by eating, drinking and cultural experiences. If you want to get a taste of what Melbourne has to offer you couldn’t have a better jumping off point.